The subtitle of Bart Ehrman’s Did Jesus Exist? promises The Historical Argument for Jesus of Nazareth. 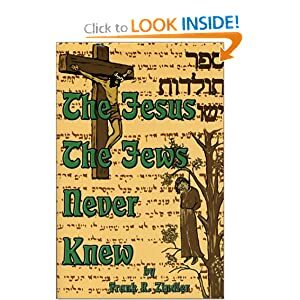 This leads prospective readers to expect that the Jesus of concern in the book is to be associated with the “town” of Nazareth and that it is this identifying tie between Nazareth and Jesus that will be the major investigative concern of the book. One would expect to find evidence supporting the historical existence of not just any-old Jesus. Rather, one anticipates learning the evidence supporting the existence of a Jesus who lived in a place called Nazareth at the turn of the era. Evangelical and fundamentalist readers might further expect to learn whether or not the Nazareth from which Ehrman’s Jesus came was the place described in the gospels—a town big enough to have a synagogue placed “on the brow of the hill” (Luke 4:28-30). Alas, the Jesus of Nazareth found in Bart’s subtitle is almost completely absent from the book. Only eleven times in the 360-page book can we find the expression “Jesus of Nazareth,” although the word “Nazareth” occurs 87 times. Three of the 11 appearances of “Jesus of Nazareth” occur on the title page, the copyright page, and a section heading. He appears two more times in the references at the back of the book, leaving a total of six places in the book where the phrase “Jesus of Nazareth” is actually employed by Ehrman himself. This averages one occurrence per every 60 pages! This fact does not promote the impression that Jesus of Nazareth is the actual character whose historical existence Ehrman intends to establish. So there you have it! Ehrman’s book proving the historical existence of Jesus of Nazareth might actually be proving the existence of Jesus of Hoboken, Jesus of Rancho Cucamonga, or even the Jesus of Timbukthree instead! In the second edition of this book, I would suggest the subtitle be changed to read The Historical Argument for Jesus of Fill-in-the-Blank. Contrary to Ehrman’s claim, however, Josephus never refers to a “Jesus of Nazareth.” (Amazingly, Ehrman actually quotes the two disputed Josephan passages in his book where readers can immediately see that Nazareth does not occur in the passages quoted!) This fact is important, because Josephus, although he refers to forty-five places in Galilee and fortified a town less than two miles from present-day Nazareth, knew nothing of Nazareth itself. Naturally, then, he could not be witness to any character styled Jesus of Nazareth. Moreover, Josephus was from a priestly family. How could he have ignored a polis [city-state] that had a synagogue? Formally, this anecdote is merely a reference to personal experience. Even so, it makes the concealed unsubstantiated claim that “we can say a good deal [about Jesus] as a historical figure.” One easily can forget that this hidden claim is a wild exaggeration. We can say a good deal about Jesus of Nazareth? Really? Why, then, does Ehrman say virtually nothing specifically pertaining to Jesus of Nazareth in his entire book? Simply stating the obvious fact that the vast majority of New Testament specialists are historicists is not evidence for the concealed proposition “Jesus of Nazareth once lived in Roman Palestine and was crucified by Pontius Pilate.” That is a statement in need of proof—proof for which mythicists seek in vain in the pages of Ehrman’s book. We are left, therefore, with a book that isn’t really intended to prove the existence of a god-man who came from a place called Nazareth. Ehrman has hedged his bets and is attempting to prove the existence of any Jesus who can be pressed into service to explain a unitary origin of Christianity. One may fairly ask at this point, “Why should this initiating stimulator have been named Jesus either? Wasn’t he named Jesus because the Aramaic equivalent (yeshua‘) means Savior? In Septuagint Greek, the word IESOUS can also represent the name Joshua. Maybe we should be looking for a Joshua instead of a Savior? But why, exactly, would Ehrman suppose that Jesus is the first name of his putative character, rather than a title or epithet? He knows that Christ is a title, not a name. Why not Jesus? Moreover, wasn’t Jesus the ultimate name bestowed upon Paul’s “Christ Jesus” in the so-called Kenosis Hymn (Philippians 2:5-11)? Isn’t Jesus here a name of magical power given to a being who was called “Christ” before he was titled Jesus? Isn’t that why we still find occasional references to Christ Jesus instead of Jesus Christ? Is it not the case that if – as the consensus of historicist scholarly opinion holds – unlike Hinduism and traditional Egyptian, Greek and Roman religions, Christianity began at a single point in time and was initiated by a single person, couldn’t that person have been named Ichabod as well as Savior? Couldn’t the name of Savior have been given to him after his death? If we no longer have to think of Christianity as having been founded by a “Jesus of Nazareth,” couldn’t it have been founded by someone named anything at all? In Did Jesus Exist? Ehrman claims to have presented evidence for the existence of “Jesus of Nazareth.” Mythicists in the rebuttals that will follow me, however, shall look for evidence for the existence of Ehrman’s evidence. Nazareth is not mentioned even once in the entire Old Testament, nor do any ancient historians or geographers mention it before the beginning of the fourth century. The Talmud, although it names 63 Galilean towns, knows nothing of Nazareth. Josephus, who wrote extensively about Galilee (a region roughly the size of Rhode Island) and conducted military operations back and forth across the tiny territory in the last half of the first century, mentions Nazareth not even once — although he does mention by name 45 other cities and villages of Galilee. This is even more telling when one discovers that Josephus does mention Japha, a village which is just over a mile from present-day Nazareth! Josephus tells us that he was occupied there for some time. Today, Japha can be considered a suburb of Nazareth, but in Josephus’ day, I’ll wager, the people of Japha buried their dead in the tombs of the unnamed necropolis that now underlies the modern city called Nazareth…. Paul never locates Jesus physically, whether in Nazareth, Galilee, Jerusalem or Bethlehem. Why then did the Gospel authors say Jesus came from a town in Galilee? The evidence is sketchy. What seems most plausible to me is that the Nazarenes were a radical messianic Gnostic sect, linked to groups such as the Essenes and Ebionites, who provided a large part of the impetus for imagining that the messianic prophecies of the Old Testament had been fulfilled. However, with the Roman destruction of Jerusalem, it is plausible that the Nazarenes were banned. So, early Christians faced political difficulties in describing Jesus as a Nazarene, without linking this title o a safer political basis. As Jesus was gradually carnalized, turned into a historical person, the Evangelists faced the problem of inventing a life story, in a way that would give some acknowledgement to the role of the Nazarenes while not going too far in a direction viewed as seditious. Hence the invention of Nazareth in Galilee. Jesus says (Mark 4:34; Matt 13:10-11, 34) that everything told to the public is a parable, whlle the truth is reserved for the initiates. The whole story of the historical Jesus can be viewed as a parable, a public story with a hidden symbolic meaning, designed to provide a believable account to expand public interest. For the Gnostic initiates, the whole story of Jesus is explained as a cosmic parable, with Jesus as a symbol of the sun. Nazareth too makes sense in this framework as a parable, aiming to provide a believable historical story, while also pointing to a concealed meaning. I find it to be hilarious yet disturbing when people still trying to prove a thing even if it has been refuted several times. Bart Ehrman is no different to an eight-year old child arguing with his 20-year brother that Superman didn’t exist. And of course, after this comment. Evemerists and Theists would troll on this site and I simply find it amusing. The more they attack, the more it becomes obvious and more people starts to investigate the mythical nature of religions. Jonathan-Outstanding analogy, Theists and Evemerists have been attacking Acharya for years. She uses documented evidence from reputable scholars as well as her own work. They use logical fallacies and outright lies, all demonstrably so. If they abided by the rules of debate they wouldn’t even begin. Their position begins with lies and can only be supported by lies. These theists like Ehrman defends their faith because of their vested interests. It was Mr. Zindler’s enlightening articles on the American Atheists website which persuaded me that geographical and historical errors in the New Testament establish that Jesus of Nazareth is a creation of second century writers. Mr. Zindler’s thorough analysis of historical and archeological evidence convinces me that the town of Nazareth did not exist in the first century. He has demonstrated to my satisfaction that the marble fragment discovered in Caesarea in 1962 does not contain a reference to any town named Nazareth, particularly, any town with that name existing in the first century. I recommend Mr. Zindler’s article “How Jesus Got a Life” which can be found at http://www.atheists.org/content/how-jesus-got-life . Thank you, Mr. Zindler, for your scholarship, superb writing, and sharing of your well-reasoned opinions. Mister Zindler does not proof anything . In ancient times it was quite common as it is nowadays to give the same name to a town or (little)village after the name of a valley or a region already in existence , may be for hundreds of years . A small region with a group of jewish people , some hundreds of people in a region or valley could on first hand been have named after the name of the region or valley they lived in . Called something like nazareth or nazzarene or something similar . If it were a couple of hundred people it would not have been mentioned in other historical scriptures . Later on , of course the usual practice of upgrading starts , only to give some body and cachet to the place of origin of Jesus . It is the same thing with the stories of king david and solomon , there is no shred of evidence that proofs they have ever existed . Every one may believe in it . Every one may deny it , but they also don’t have any hard evidence of the non-existence of Jesus of Nazareth either . peter…look at the last line of your post. You said…”they don’t have any hard evidence of the non-existence of jesus of Nazareth either” It is not incumbent upon those that don’t believe to prove that the wild claims of someone else are not true…it is incumbent upon those that make the ridiculous claims to prove that they are true. Besides, when you prove that Nazareth didn’t exist when the story of jesus was supposed to have taken place, it absolutely destroys the christian fairytale. I also disagree with the CLAIM that there’s no evidence that no such person called Jesus of Nazareth (“Jesus _the_ Nazarene” in the original Greek!) as depicted in the Bible ever existed. There is a preponderance of evidence so vast, that when taken as a whole, becomes concrete evidence proving the mythicist position, and it strikingly contrasts with both the vast lacunae of concrete evidence supporting the Christians claim, and the discredited interpolations which Christian apoligists keep returning to ad nasaeum. both. And remember, anecdotes are not evidence. When ALL evidence concerning the existence of Jesus is gathered together at once to be vetted, and all ‘opinions’, anecdotes, and discredited interpolations are rejected, all that remains as credible evidence is that preponderance which soundly supports the mythicist position. This sure is an attempt to require proving a negative. Anyways, then you must admit as an evemerist that the rest of Gods and Goddesses must have had also a mortal counter part too, right? However, Acharya S. has plentifully answered through her books and numerous articles why the position that Jesus of Nazareth is the only god that had a real man as his historical core is simply B.S. It’s not about trying to prove a negative as that would be a fallacy in this particular case. We’re investigating the claims made by theists (specifically Christians in this case). Either there’s evidence to substantiate the claims or there’s not – and there’s not. Those who make the claim are responsible for providing the ‘burden of proof’ i.e. credible evidence to support the claims. Theists have always failed miserably in this task. Shane, every single one of your posts has been posted so, I’m not sure what you’re talking about. So, either God doesn’t give care about you or he doesn’t exist. All theistic arguments have failed – there’s still not a shred of valid evidence for supernatural religious claims. If there were any credible evidence faith and euphoria would not be the main requirement. It seems more likely that religion is a human creation with an obsession of ridding the world of non-believers. At the end of the tribulation, apocalypse and Armageddon, the book of Revelation makes it clear that eventually 2/3rds of the human population (all non-believers of course = [b]discrimination[/b]) will be killed in what the religious tolerance website calls “[i]the largest mass extermination of humans in history[/i].” ([url]http://www.religioustolerance.org/rapture.htm[/url]) With nearly 7 billion people on the planet right now that’s 5.25 billion who will be murdered in the ‘End Times.’ ([url]https://www.freethoughtnation.com/forums/viewtopic.php?f=16&t=2329[/url]) What a sweet God you’ve got there (sarcasm). You’ve come up with assorted excuses to cover for all the severe lack of evidence but, the one thing you haven’t done is acknowledge that there exists no credible evidence for Jesus. As a former Christian, I understand how hard that is but, as some point, one has to make a decision to be honest and respect oneself. I simply couldn’t lie or fool myself any longer. I’m far better off for it and so are all the other former Christians I know. Do you have anything to say that’s actually on the topic of this blog? I get the vibe that you’re about to start proselytizing soon. There exists no valid evidence to support god as “sweet” or “nasty,” as there’s no credible evidence of gods existence. We here do not “hate” what does not exist. What we have distaste for and are tired of are people pushing their own faith and euphoria upon us all and shoving it down our throats when theists can’t even fulfill their responsibility of ‘burden of proof’ to back up their claims with valid evidence. Then you haven’t really checked, Atheists are the most generous ([url]http://ieet.org/index.php/IEET/more/pellissier20111125[/url]) both on an individual level and by country. Perhaps atheists are either afraid to live in your town or maybe they’ve been run out or are afraid to publicly acknowledge they are non-believers. For one I do not support the ridiculous claims of any such imagery as you might say:”The idea that God is an oversized white male with a flowing beard who sits in the sky and tallies the fall of every sparrow is ludicrous. However ludicrous the idea to you , recent scientific theory surrounding black holes is a cosmic record of every electromagnic goings on in the known universe, a kind of record of all . And while such theories exist , there is no credible evidence as such to date. And if a person where to look at the bible and actually have a desire to understand will easily see that it plainly states that god cannot be tested, found, or seen but evidence of his passing over the enterity of creation would be recognizable to the faithful pursuer. Just like science now says the totatallity of the physical universe is pervaded by more of what can’t tested, found ,or seen , and it’s omnipresent . Science also states that it’s presence is only known by observing what’s not there among the inadequate substances that are observable but cannot account for the vastness ( space)of all that is known. Now here’s my point , authors of such dribble postulating ridiculous mythology as absolute fact is ludicrous , especialy in a scientific proven day and age and you won’t hear me pushing such tripe! If I do call me on it ! But don’t speculate on my faith, ask I will glady tell you. I live in the bible belt buckle of America and that should answer any questions about my hometown but not of me. You’d think people who believed so strongly that they are correct would actually know how to communicate effectively. Are you talking about me? Suggestions for effective communication are gladly welcome.but if you just want to criticize you aren’t any help but just hurtful .effective communication takes at least two. But if you are talking too me it might be a hopeless cause, depending Your point of view. Cause plenty of people understand me on a daily basis , even if they don’t agree . Are you willing to explain to me how to understand your criticizim? “Nazareth” was described as a “city” (polis); it supposedly had a synagogue; it was large enough to drum up an angry mob; and it had a precipice that a person could conceivably be thrown off of. If you look up some modern pictures of what is now known as Nazareth, you will see it is a bowl with gently sloping hills to the one side. If this had been the place, the angry mob would have sought to roll him down rather than throw him off. “Christians, needless to say, utterly detest one another; they slander each other constantly with the vilest forms of abuse, and cannot come to any sort of agreement in their teaching. What of Melito, Bishop of Sardis (late 2nd Century CE), as described by the Rev. Robert Taylor in his “Diegesis”? If none of the above is enough to qualify as “hard evidence of the non-existence of Jesus of Nazareth,” then what, pray tell, could possible be? Look, if you want to believe because you *like* believing, nobody’s going to criticize you for that. That’s fine – that’s your right. But saying that your liking it somehow translates into demonstrable, objective proof?? That’s going just a BIT too far. Why did the cult of christianty become the largest religion in the world. How about the ‘snow ball effect” with a whole lot of luck. Certain unnamed Jews in the first century CE came up with a different idea about what the messiah should be like. The traditional war-like one apparently wasn’t coming so they tweaked the messiah notion a little to see if any fools would be interested. Well now, this new idea attracted a few Jews tired of waiting for the war-like messiah and certain literate Jews figured that they could get this new belief going. And guess what? It seemed to work. Some of the illiterate Jews thought it was a pretty good idea, and this cult slowly grew amongst the Jews. Then all kinds of different off-shoots began to develop concerning the cult. Were gentiles allowed in? Was circumsion still mandatory? What about the women? Kosher etc. Wow, this new thing is really growing, and thanks to the efficient ways of communicating and travelling in the Roman world this cult grew and grew until, by Jove, the emperor even said “Yes, this is the true religion” Wow, what a lucky break! Of course, by this time all the Jews that started the myths and knew that they were myths were long dead. So now almost everyone who was serious about this religion really believed the stories even if the stories were constantly changing. Jesus, Christ, or whatever one wants to call him certainly did not exist! He was a made-up figure just as all of the other messiahs were. It just so happened that with a hard-core group of followers and with the extremely good luck of living during the Roman Empire this low-shelf cult became a powerful and destructive religion.